Avoid Tripping Hazards– It’s important to make sure the pathway to your front door is clear of any potential tripping and slipping hazards. Extension wires that cross a walkway should by taped down and any hanging structures should be tightly secured. Don’t Let the Kids Carve the Pumpkins– Allow the kids to draw the faces and make the designs, but the carving should be done by an adult. 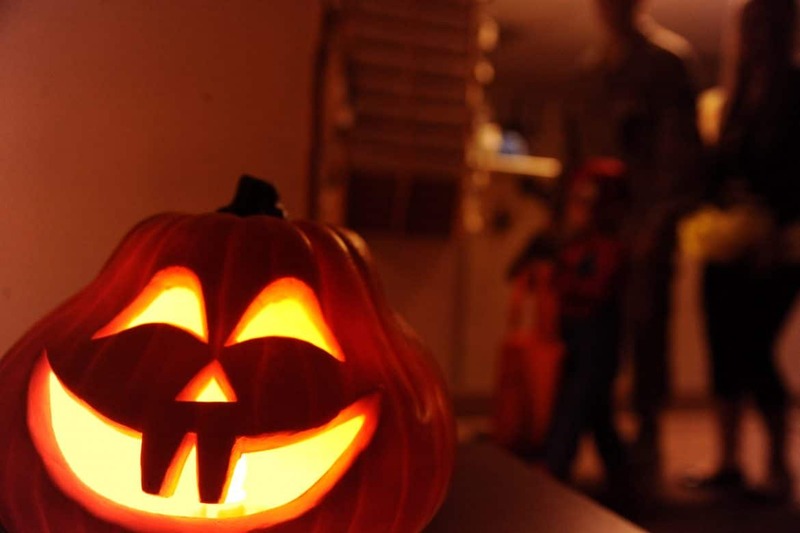 Avoid Using Candles– Candles are great flair for any home’s Halloween decor, but can pose a serious risk for house-fires and burn risks if kept where small children can access them. Use light bulbs for a safe alternative. Have a Full Meal Before Going– Make sure your kids have eaten before going trick-or-treating, so they won’t fill up so much on candy. No Crossing In-Between Cars– Because younger kids aren’t used to walking around at night, they may not realize it’s harder for vehicles to see them. Explain to them that crossing the street between cars is never a good idea, and it can be especially dangerous when it’s dark outside since there’s less visibility. Enlist a Chaperone– Have children trick-or-treat in groups with a trusted adult. Go along yourself and make more great family memories. Inspect Trick-or-Treat Candy– Avoid any homemade treats unless you know the person who made them well. Each piece of candy should also be inspected for choking hazards or tampering. Protect Their Skin– Masks, face paints, and color sprays may make a costume frightening, but chemicals used in them can be even more scary. Before your child is exposed to breathing in dangerous chemicals from a cheap mask, or exposed their skin to hazardous paints, examine which ones are child-safe. Make Sure All Masks Are Safe– After making sure that the materials used in the mask are non-hazardous, you should also check that it doesn’t obscure hearing or sight, as these issues can make it hard to see tripping hazards or hear traffic. Finding a Fire-Resistant Costume Should be a Priority– Look for costumes that have been fire treated to keep you children safe from accidents that may involve fire. Also, tell the kids to stay away from lit candles or any other open flames. Accessorize Safely– Any accessories (knives, swords, etc.) should be soft and flexible to prevent injuries from occurring to the child or those around them. While it may be easy to overlook some of the above around Halloween, NOT paying attention to them could cost you dearly! Whether it means the injury of a loved one, friend, or neighbor or if your focus is the potential financial burden (even if insurance covers it, you may see a rise in your premiums after your claim), being safe on Halloween is very important! If you have any questions about the information outlined above or want to check your coverage this October, contact the Trottier Insurance Group today!